Preoperative imaging is increasingly being adopted for preoperative planning in plastic and reconstructive surgery. Accurate preoperative analysis can reduce the length of operations and maximize surgical design and dissection techniques. Comprised of contributions from world-class experts in the field, Imaging for Plastic Surgery is an essential imaging resource for surgeons, radiologists, and patient care professionals. "... gathers all necessary information on the added value that each imaging modality can provide in most clinical scenarios found in plastic and reconstructive surgery. ... 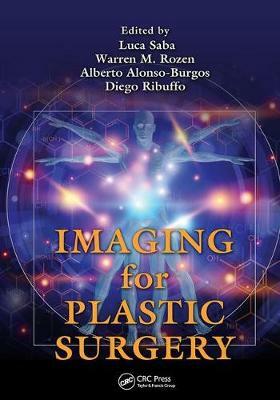 Starting with an introduction to imaging modalities that can be used during preoperative planning of plastic and reconstructive surgery, the book further comprises sections that compile the essentials of imaging for the reconstruction of the face, head and neck, breast, abdomen, and upper and lower extremities. ... Imaging for Plastic Surgery has the potential to engage not only plastic surgeons, but also professionals that actively participate in patient care. This can easily be the manual of many radiology and plastic surgery residents, in which they will be able to find all necessary information about what imaging can add to their next surgery. ... Imaging for Plastic Surgery goes beyond the traditional use of imaging in medicine and deals with a novel clinical application of non-invasive imaging in the surgical field. Image-based accurate preoperative assessment of potential surgical strategies and techniques will undoubtedly result in better patient outcome and optimization of resources. This book comprises the essential knowledge about what every available imaging modality can offer and emphasizes their strengths and weaknesses. Furthermore, most relevant principles comprehending imaging and surgical procedures are thoroughly presented in this book. Readers will find in Imaging for Plastic Surgery a clear path to follow when considering the potential benefit of using imaging techniques for preoperative planning of almost every surgical procedure in the field of plastic and reconstructive surgery." "Registrars and consultants alike will find this book an excellent reference text to learn more about the radiographic tests we order and to make sure we are up to date with the new technologies now offered by our colleagues. Technology is rapidly expanding and new imaging techniques allow us to obtain a much better preoperative assessment for planning of the operative procedure. This text clearly defines the roles of these newer tests and [defines] which [tests] are the most appropriate to be ordered." extensively tackle the subject of medical imaging as it relates to plastic surgery in general and certainly none that cover it in such breadth and in such detail. I found it to be very informative and I believe it adequately fills an obvious gap in the plastic surgery library for use by trainees and consultants alike. A fascinating journey through the latest and most innovative imaging procedures that identify relevant underlying structures of human anatomy, crucial for the planning and execution of successful surgery.